Omnibug is a plugin for the Google Chrome and Mozilla Firefox browsers to ease developing and debugging web metrics implementations. Each outgoing request (sent by the browser) is checked for a pattern; if a match occurs, the URL is displayed and decoded to show the details of the request. My first feature as an official contributor to Omnibug is the addition of icons to entries in the requests view. Depending on when I publish this and when Omnibug releases an update, this feature might already be in place. Since I never really feel like I know something until I write about it, I will illustrate how I added these icons. It was fairly simple to implement (thanks to the excellent structure of Omnibug) and is done in two different parts: adding the icons, and showing/hiding them based on user’s settings. Before I can display the icons, I need to get the image files. 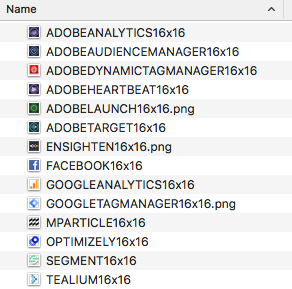 Favicons are ubiquitous and about the size I am looking for (16px x 16px). After some conversions from .ico to .png (some sites used a png for their favicon which I didn’t know was possible) I was ready to start inserting them. Each provider entry in the request view contains a <span> with a title that specifies the provider. I used this title attribute to select the span and insert the corresponding icon using the ::before pseudo selector with a content rule. Iterating over $icons and generating new rules happens in panel.scss which holds all the CSS rules for the main Omnibug view. I then added a few rules for spacing and layout. Everything looking good! Users have the ability to toggle showing the icons on and off in the Omnibug settings. Since the entry view is controlled by CSS, and the icons are shown by default, I use the settings toggle to add rules to hide the icons. As opposed to hiding the icons by default and adding rules to show them. The global settings object (OmnibugSettings)for Omnibug can be seen in the file src/libs/OmnibugSettings.js. I am adding a key to the getDefaults function (which as its name would suggest, sets default settings values) called providerIcons with a value of true. This value will determine whether the icons should be shown and will update according to the checkbox in the settings view. This global settings object is manipulated as the user changes settings. In the file src/devtools/panel.js a new OmnibugSettings object called settings is created and populated with default settings. When the settings are saved or updated by the user, this object will change to reflect the new settings. If settings.providerIcons is not true, a CSS rule will be inserted into the view that resets the content attribute (used to specify the icon png) to being an empty string. Setting this to null or none instead of an empty string messes up the spacing of the provider name. I am not sure why. Finally, I added the checkbox into the settings view. You can see this in the file src/options/options.html. The settings file receives data from these options when the user changes anything. This is facilitated by the data-bind-property attribute.